5 Outbound Sales Mistakes That Can Break Your SaaS Company - and how to avoid them. HipLead works closely with the sales and marketing teams of successful SaaS companies on a daily basis. We see organizations unknowingly sabotage their outbound sales when they make the following 5 critical mistakes (which seem harmless at first). You’ll be surprised at how a little planning can not only help you avoid these mistakes, but actually improve lead quality and increase closed sales by 2X-5X. The best part is you may already have most of the data you need to do this. Below is a list of the top 5 mistakes that SaaS companies make in prospecting & outbound sales… and how to avoid them. Mistake #1: Reaching out to prospects without defining clear goals. Typical Excuse: "We'll just see how it goes." If you want to “just see how it goes” you’ll likely end up spinning your wheels and burning through months of sourcing with lackluster results. At HipLead, we track the following pipeline stats on a weekly basis and make them available to the entire sales team. When we started breaking goals down like this we saw a significant increase in qualified opportunities from outbound, because we knew what to focus on today in order to achieve our desired result down the track. It also gave us a clear assessment each week of whether we were on target or falling behind. Here's a shot of our weekly outbound stats (taken midweek). 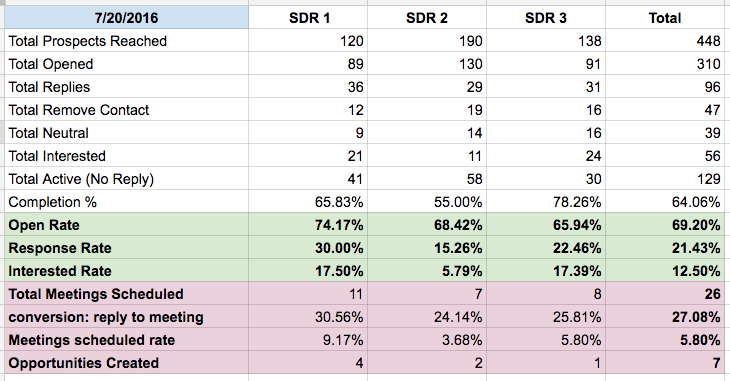 With a plan and tracking, we can ensure our SDRs supply the leads we need to hit our goals. Mistake #2: Sourcing prospects without specifically defining sourcing criteria. Typical Excuse: "We're behind on lead generation and don't have time to plan." Before your team starts prospecting it’s a good idea to define best-guess criteria for the accounts that should be targeted initially. It seems obvious but you’d be surprised how many sales teams just dive in without specific sourcing criteria. It's is a recipe for failure that can waste an incredible amount of time in the long run. Perhaps even more importantly, you should also define the criteria for accounts that should not be targeted. Sure, you’ll be able to close a few deals without defining who you want to target, but your results will be more on the random side. You won’t be able to learn much from them. Properly defining this sourcing criteria will ensure that your future efforts are measurable, consistent and more successful. You’re never too busy to do this, because doing it will make you less busy. The easiest way to get started is to research your current and past clients. Hit Linkedin, Crunchbase, etc. and get their specifics (industry, company size, funding, etc.). Then use that criteria as a starting point. Looking at this data will give you new prospecting ideas that you never thought to explore. When we implement this for our clients we increase conversions from lead to opportunity by 10-25% and save each SDR around 5 hours per week, because they waste less time on leads that are unlikely to convert. Mistake #3: Only loading names and email addresses into your CRM or marketing automation system. Typical Excuse: "Just add the basic info, we need to send these emails out ASAP." If you’re only loading names and email addresses into your CRM it's difficult to understand what is and isn't working from a prospecting and outreach perspective. Here's a shot of title and industry performance analysis on one of our client's outbound campaigns. You can't do this unless this data is loaded into your CRM or marketing automation system before you start sending. If you don’t load the data in from the get-go it can be a bit of a nightmare to do it later on. At HipLead we keep track of employee title, company location, company size, industry, funding and a lot more. If you’re interested, we can easily enrich your existing dataset using our data and help you understand what audience segments are best performing. Just fill out the form below or email us at info@hiplead.com. Typical Excuse: "Changing the copy takes a lot of time and won’t make a huge difference." You really are hurting your conversion rates by not testing many different subject lines and different email copy. At HipLead, we help our clients run hundreds of outbound campaigns each month, and very often the subject or email copy that performs best, is not the one that we thought would. More often that you would expect, the A/B test winner is everyone's least favorite subject. A/B testing does not work if you don't analyze the data objectively. Trying a bunch of different subject lines and then going off your gut without looking at the numbers will send you in the wrong direction. In order to A/B test properly, you must only test a subset of the total leads you have for a particular campaign. Our guideline is to reserve 20% of the total leads for testing and to run at least three rounds of tests. Only send the remaining 80% of leads once your are satisfied with the test results. If you don't spend your time A/B testing emails before launching a campaign, you are leaving significant revenue on the table. 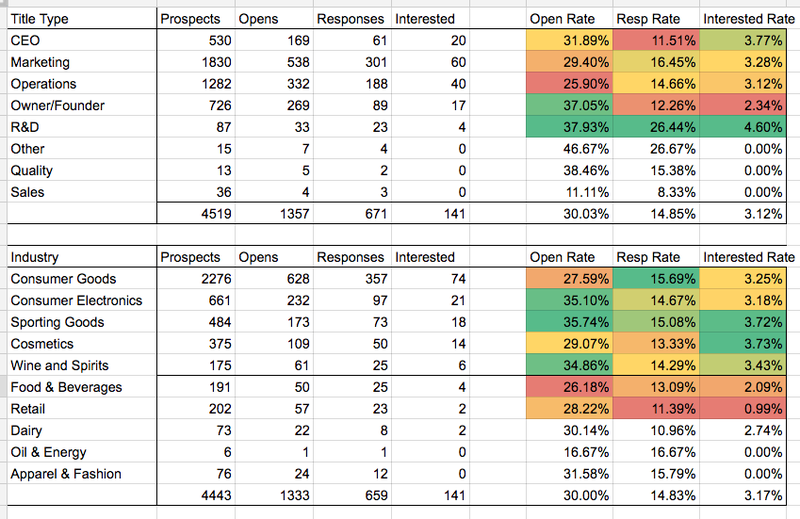 This is part of an analysis we ran comparing two weeks of A/B tests. As you can see, simply turning off the worst-performing subject significantly boosted the over-all performance of the campaign. After running two more weeks of tests and tweaks, the winning subject line and copy ended up getting a 7.5% interested rate. If we hadn't turned off any and ran all four, we'd have a 4% reply rate. If we didn't test anything and happened to just run the worst performing subject line, we would have ended up with a campaign that performed at 2.9% interested rate. Typical Excuse: "Changing the copy won’t make a big difference." Outbound sales can give your SaaS company dependable growth over time - but your efforts will fail if you do not plan ahead and properly track and analyze your efforts. If you’re struggling to find time to plan your prospecting & outbound efforts, or you don’t think a bit of strategy will make a difference, then you might be sabotaging your outbound sales without knowing it. It only takes a small amount of planning to avoid these mistakes. If you put in the effort up-front you’ll find yourself closing more deals and wasting less time chasing bad leads. HipLead can help you scale your outbound sales. If you have any questions, use the below form to request a meeting with our team. We will provide sample leads based on your target industry and specific requirements.